Ghrelin is the so-called hunger hormone. It was purified from rat stomach in 1999 and subsequently cloned. It binds to growth hormone (GH) secretagogue receptor, which strongly stimulates GH. So, for all you people who thought that eating makes you gain lean tissue, it is actually the opposite. Nothing turns off GH like food. Of course, food provides the nutrients needed to grow, so in fact, you need both feeding and fasting cycles to properly grow. Not all feeding, and not all fasting. Life lies in the balance of the two. The cycle of life is feast and fast. Ghrelin, has also been found to increase appetite and weight gain. It also antagonizes the effect of leptin (in rats at least). Leptin, as you might recall, is the hormone produced by fat cells which turns off appetite and makes us stop eating. Ghrelin turns on appetite. So, if you want to lose weight on a long term basis, you need to tune down ghrelin. So, how to do that? As we discussed last week, eating all the time sounds like it will turn off hunger and ghrelin. But that’s far too simplistic. Surprisingly, the answer is the opposite – fasting. Let’s look at this study “Spontaneous 24-h ghrelin secretion pattern in fasting subjects“. 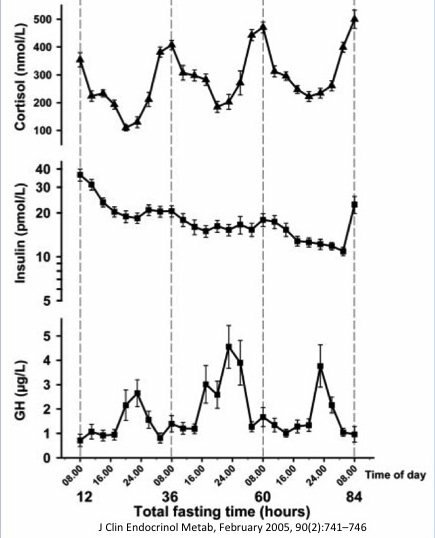 Patients undertook a 33 hour fast, and ghrelin was measured every 20 minutes. Here’s what ghrelin levels look like over time. There are several things to notice. First, ghrelin levels are lowest at approximately 9:00 in the morning. This corresponds to the measures of the circadian rhythm which find consistently that hunger is lowest first thing in the morning. Recall that this is also generally the longest period of the day where you have not eaten. This reinforces the fact that hunger is not simply a function of ‘not having eaten in a while’. At 9:00, you have not eaten for about 14 hours, yet you are the least hungry. Eating, remember, does not necessarily make you less hungry. Next, notice that there are 3 distinct peaks corresponding to lunch, dinner and the next day’s breakfast. BUT IT DOES NOT CONTINUALLY INCREASE. After the initial wave of hunger, it recedes, even if you don’t eat. 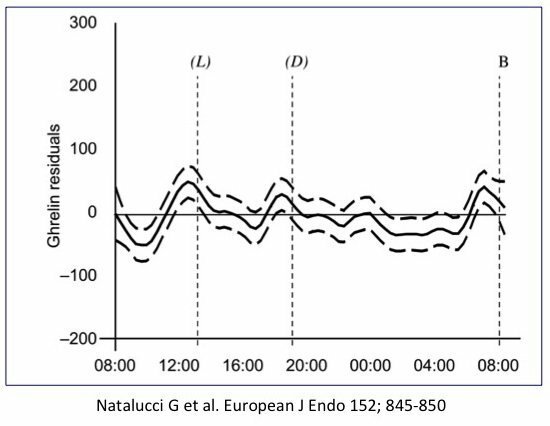 Ghrelin shows a “spontaneous decrease after approximately 2 h without food consumption”. This correlates perfectly to our clinical experience that ‘hunger comes in waves’. If you simply ignore it, it will disappear. Think of a time that you were too busy and worked right through lunch. At about 1:00 you were hungry, but if you just drank some tea, by 3:00 pm, you were no longer hungry. Ride the waves – it passes. Same goes for dinner. Further it has been shown that ghrelin spontaneously decreases independently of serum insulin or glucose levels. Also, note that ghrelin does have a learned component since all these subjects were used to eating 3 meals per day. It is not merely by coincidence that these peaks of ghrelin happen. This is similar to the ‘cephalic phase’ of insulin secretion that we’ve discussed previously. There was one other big finding of this study. Look at the average ghrelin levels over 24 hours. Over the day of fasting, ghrelin stays stable! In other words, eating nothing over 33 hours made you no more or less hungry than when you started! Whether you ate or did not eat, your hunger level stayed the same. As we discussed in our last post – eating more sometime makes you more hungry, not less. In the same vein, eating less can actually make you physically less hungry. That’s terrific, because if you are less hungry, you will eat less, and are more likely to lose weight. So what happens over multiple days of fasting? This study looked at the question specifically. 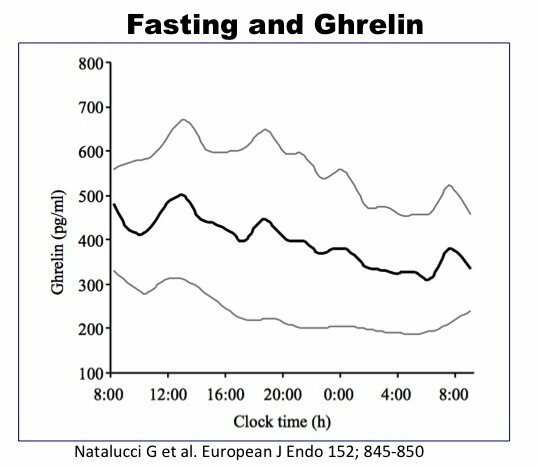 33 subjects had their ghrelin measured over 84 hours of fasting and they divided the results by men and women, as well as obese and lean. There were no significant differences between the lean and obese subjects, so I won’t dwell on that further. Once again, there were distinct circadian variations. Over 3 days of fasting, ghrelin gradually DECREASED. This means that patients were far LESS hungry despite not having eaten for the past 3 days. This jives perfectly with our clinical experience with patients undergoing extended fasting. They all expect to be ravenously hungry, but actually find that their hunger completely disappears. They always come in saying ‘I can’t eat much anymore. I get full so fast. I think my stomach shrank’. That’s PERFECT, because if you are eating less but getting more full, you are going to be more likely to keep the weight off. Notice, also the difference between men and women. There’s only a mild effect for men. But the women show a huge decrease in ghrelin. Again, this addresses one of the major worries that women are not able to fast. Actually, women would be expected to have more benefit from fasting because their hunger can be expected to decrease better than men. Notice, too, how much higher women’s ghrelin level reaches. I suspect this correlates to the clinical observation that many more women are ‘addicted’ to certain foods eg. chocoholics. Sugar addicts. etc. So many women have remarked how a longer fast seemed to completely turn off those cravings. This is the physiologic reason why. A few other notes about the hormonal changes of fasting. Notice that cortisol does go up during fasting. Yes, fasting is a stress to the body and cortisol acts as general activator as well as trying to move glucose out of storage and into the blood. So, if too much cortisol is your problem, then fasting may not be right for you. Insulin also goes down, which is what we expect. Growth hormone, as we’ve previously noted, goes up during fasting. I suspect this helps to maintain lean muscle tissue and to rebuild lost protein when you start to eat again. However, the main point of this post is to show that over intermittent and extended fasting, ghrelin, the main hormonal mediator of hunger does not increase to unmanageable levels. Rather it decreases – which is exactly what we are looking for. We want to eat less, but be more full. Fasting, unlike caloric restriction diets is the way to do that. If I’m looking at the chart correctly the most benefit on getting GH is on the second day of fasting? How would this be done as far as an eating pattern standpoint? Dr. Feng thanks for great articles, after practicing your fasting strategy for half a year, I find that many times when I eat is not because of hunger, but because the brain suddenly appears to have a strong idea of eating some kind of food, and hormones are Can not control the idea, which makes me very troubled. Do not know other friends have such trouble. Very much hope you can give good advice, very grateful. But does the reduction survive in the week after the fast when the patient returns to “normal” eating? I think worrying about if you have a cortisol problem will cause a cortisol problem as worrying is stressful. What you said sounds like insulin resistance. Try a five day water fast. It’s all downhill after the 2nd day. That will 1) do wonders for you intra-organ fat and 2) do wonders for you confidence you can handle fasting. If you can do 5 days of water only going 24 or 36 or even 72 hours w/o food (lots of water though) will be a snap. I think people are confusing Dawn Phenomenon with a bad thing. As described by Fung, it’s perfectly normal and occurs in everyone that wakes up, before they wake up as a prelude to waking up. Yes…Adrenaline, Cortisol, Norepinephrine are the three major stress hormones that mobilize your body for action. Dr. Fung, Thank you for another fantastic post! If you have high cortisol fasting may not be for you? Blanket statement end stop? Why not post a link to where you know how to control fasting I’ve read your book Obesity Code at least 3 times now and never remember you saying such a thing. I also found this alarming, having read both books! Hope there is a substantive response to this, or at least expanding on what exactly this means. Dr Fung discusses cortisol in more depth in Complete Guide to Fasting. He basically said generally, in his practice, he has not found this to be an issue but in one case it was and it forced ‘changing the strategy”. If you are concerned you should exercise more as that is far more relaxing that watching TV, per Dr Fung. Also try ‘mindfulness’ and meditation, also covered by Dr Fung. Just wondering what kind of ‘problems’ you had in a 24h fast? What symptoms indicate that fasting was not for you because of cortisol? Dr. Fung, thanks for the great article. How do you read the terminal spike in insulin? Looks like day 2 is flattish. Day 3 falls. And then it spikes on the morning of day 4. Is that a case for multiple 72 hour fasts? I suspect that they broke the fast that last morning, right before the end of the study. The spike in insulin on day 4 comes from eating breakfast. Thanks BobM – would be most interested to hear your experience. I am also trying a fast during the week/eat on weekends approach and it is incredibly tough, but I am determined to get the better of my hunger, even though it feels very extreme and painful at times. hormone . Are you the same? It is just an idea. The more you are involve in this idea, the more you become hungry. Your mind is hungry. Your body is not hungry. Make sense? Just ignore it and it will disappear like a phantom. Thank you for your answer, your solution sounds pretty good but hard to do. Because people are not completely rational, I hope someone can find an effective solution. I reply this way to you as you are a Chinese. This is a Taoist or Buddhist approach. No need to see psychologist on how the mind work. This is meditation 101. As far as I know, bodybuilders can insist on dieting because there are games, personal coaches and models can insist on diet because of the need to rely on a good body to make money. For ordinary people, this expedient is difficult to long-term effective. We should find a way to easily long-term adherence. I tried meditation this morning, and I could really control the idea of eating something. Thank you for your suggestion, my email address is: ads98163@163.com, hope we can be a good friend. This is one of the best solutions I’ve ever read about controlling heart addiction. Thank you very much. what your facebook username is and hope to communicate frequently. Sometimes we need to control the body with mind, and sometimes we need to believe in the body, not the mind. I think Dr. Feng ignored the bigger problem of emotional eating , and if you do not solve the emotional eating problem, adhere to fasting is very difficult. I mix the juice from half a lemon in 2 litres water. Whenever I feel hunger I drink another sip of water and forget the hunger. Some days 2 litres last all day, other days I must make up one more jug. I also stopped smoking in the same way, now over 10 years ago. It worked fine for me, for 5-day fasts. Maybe it can help you. When should you eat relative to exercise (weight training) if you practice intermittent fasting? There are many who recommend working out right before ending your fast. Personally, I get my best workouts in while fasted, especially in the morning. My max lifts are usually 10-25% heavier while fasted. I haven’t seen any benefit though to eating immediately after your workout. I do my 30-45minute strength training workout around 8am. I break my fast in the afternoon. I have found that the workout makes it easier for me to continue my fast. Another great article and it mirrors my experiments with 24 hour, 48 hour, 72 hour and longer fasting. Monique, the brain is very poor at differentiating hunger from thirst. Even for those eating or eating regularly (no fasting at all) drink 16oz of water 30min before you eat and you’ll eat less. Another factoid, your brain will not signal full until abt 30mins after you actually are ‘full’. This is what leads many to be inadvertently over eating. As it relates to hunger while doing a water fast, drink more water, I’d say two liters or more per day. You may find that reduces your hunger. Walt, the 30 minute delay from eating to feeling full is important and very good advice. I break my fast with a drink of coconut oil and try not to eat more food for another 30 – 45 minutes. I think this helps to prevent overeating. And folks, don’t forget the salt. Very important to avoid chills and cramping. Broth is a great salt delivery mechanism. Steve, a good point. I add salt to my coconut oil and add a bit of lemon flavour. I also found magnesium helped with leg cramping. I found that many times I could not control to eat, not because of hunger, but because the brain suddenly appeared the idea to eat something , and ideas is difficult to control by hormone . Are you the same? Monique, I did not mean you as in a consciously controlled differentiation, rather a very unconscious thing the brain does. But bravo for the 3 litres of fluids/day. What’s interesting, and I had no prior knowledge of this except hunger comes in waves, is the predictability of when those waves occur. So by looking at the above graphs you could discern when to expect hunger to be at it’s worse. Another trick to consider is to eat something of little to no nutritional value just to put something in your stomach then wait 30 mins. Another thought, Dr. Fuhrman claims that hunger is the gut biome wanting carbs and is not always real hunger. He claims it is the bad bugs prompting you to eat sugar and junk. I once fasted whilst in hospital. 0 kcal for 14 days. I was given chalk-like pills to chew on twice a day against stomach acidity. Maybe that would help ? Those pills might have been simethicone which relieves bloating and flatuence. Flatuence will cause pain in your abdomen where it is excruciating. I think that is very worthwhile trying while fasting. That could be a to successfully complete a long term fast easier. I’ve noticed an awful lot of posters asking Dr Fung questions. I used to as well until I realized he either 1) doesn’t follow his blog and/or 2)doesn’t respond to questions. So for those asking him questions, when was the last time he answered you or anyone to your knowledge. Note also, this blog is advertising Diet Doctor, a for profit web site. I believe Dr Fung hangs out there as diet doctor advertises the occasional q&a with Dr Fung. Wonderful post. Thanks again Dr. Fung. I visited the local library with my copies of Dr. Fung’s books. They reviewed them and ordered a copy of each for their collection. I am donating the cost of these books in hopes others will be able to benefit from Dr. Fung’s generous gift of his time and knowledge to all of us. I’ve never been this relaxed in a very long time ever since i started breathing much much slower and allow CO2 to accumulate more in my body. Also exercise and cold showers, quick hyperventilation exercises will stimulate your SNS but afterwards you will relax even more deeply. U just gotta go with your feeling. Fasting is so amazing though im doing it for life now. So convenient as well so side effect is less stressing over making food. Although grelin is at its lowest at 9:00, it is also at its highest at 7:00… after the usual longest fast of the day, during the night. Another question I have regards bone broth. Is there a risk of consuming toxic heavy medals such as lead, arsenic, selenium, and cadmium if this is a regular part of your diet?. LOL, the data is certainly showing ‘waves’ but 2 hours (for me) is a really long wave. I am happy to have this information, I was thinking (incorrectly) that the waves were much shorter in time. Now to figure out a way to incorporate this new info. How is ghrelin affected if you are drinking BulletProof Coffee? Dawn, I drink coconut oil and find it helps to reduce my appetite. Since fasting increases cortisol, should people engaging in intermittent or extended fasts take extra calcium or other suppliments to offset bone/collagen loss? Blimey, interesting. I bet you’re popular with the girls eating lettuce and low-fat rubbish in an attempt to lose weight. Hi there how do you do vegan/ plantbased keto? Which foods or drinks can cut intermittent fasting? Does chewing gum during your fast (100% Xylitol) raise your ghrelin? After following the fasting and IDM program …how to confirm if T2D is reversed ? I started the 4 2 1 method 4 days of only fruits and veggies 2 days of meats or anything I like to eat then 1 day of fasting. What do you think? Thanks Dr Fung.I been diabetic for 20yrs, came across intermittent fasting,as a means of reversing diabetes.My doctor was impressed by my first and only lab work. I am due back next month.If my recorded daily blood sugar is anything to go by, I can not wait for that visit. I have lost only about 20lbs since July 22nd 2018 but my goal is to reverse my diabetes. This Dr Fung be some sort of genius!